Update: You can now purchase a pdf of this adventure! Last time I focused on character relationships as a way to make a classic adventure more interesting. I also shared my notes on how I converted the end of Temple of Elemental Evil‘s moathouse into D&D Next (playtest) format. I want to more specifically cover how we can easily take a classic adventure and convert it to D&D Next (Update: or 5E!). 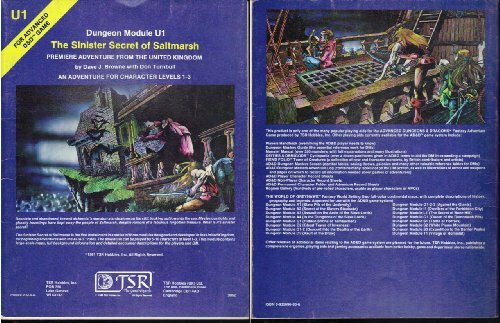 Recently I converted the classic U1, Sinister Secret of Saltmarsh, for use in D&D Next. How easy was this? It took me 30 minutes while I was in the passenger seat of a car! It is worth mentioning that Wizards recently released some ideas on extending Caves of Chaos after a party has done initial explorations. 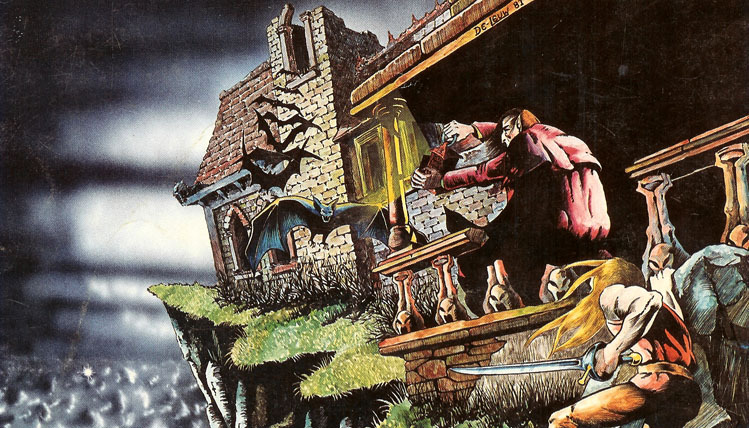 Sinister Secret of Saltmarsh is an excellent classic adventure, written in 1981 to usher in a series of adventures written in the UK (where TSR grew to have a strong presence – we can see the remains of that effort even today). When ranking the top adventures in Dungeon it was listed at 27, though I would argue it should place higher. The following methodology is used for a speedy conversion of a classic adventure. My first step was to read the adventure. I’m a strong believer in preparation. The firmer your foundation, the more you can build upon that to innovate. I went through the adventure, comparing the monsters within to the bestiary. On a scrap of paper I noted the D&D Next monsters that best worked as a substitution. In some cases, the classic monsters from the bestiary were a perfect fit. The wandering monster table has 4 goblins? Use 4 goblins! At other times it was close… giant spider? Use a giant centipede with an increase to 10 hit points and just describe it as a giant spider. Reskinning, where we use a new name for an old monster, is a key component of the conversion process. In some cases, the stat blocks can be used as they actually appear in AD&D. An example is rot grub. In AD&D they have a special attack that is more of an experience than combat (you have to burn them out quickly with fire). For a classic feel we can just give them AC10 and 1 hit point and use that special attack. If we wanted more of a 4E approach we could go with an attack and grab that causes more damage each round. Wandering Monster: Use 2 dire rats for the rats, use 1 gray ooze as the giant weasel, use 6 giant centipedes as the giant ants. Room 8: As noted above, the spider is a 10 HP giant centipede. Room 9: Giant centipede = giant centipedes! Room 11: Yellow mold is a bit tough, but a gray ooze captures the feel. Room 13: More spiders, also giant centipedes. Tricks like describing the colors of their abdomens and stripes on legs keeps things interesting. Give one a power, such as grabbing with a web blast, if the fight seems boring. Room 15: Just use a rogue PC as the NPC. Room 19: Stirges are stirges, set to a number equal to the number of PCs in the party plus 2-3. Room 20: Rot grubs, set to 1 HP and AC 10 and the classic-styled special attack as described previously. Room 23: Skeletons – skeletons! Room 24: No monsters, but I changed the scrolls to be those of Arc Lightning, Comprehend Languages, and Sleep. Room 25: For green slime I used a 30 HP gray ooze, but added in the special attack as described in the classic adventure (it attaches to the PC and in 1-4 rounds turns the victim to green slime… I favor letting this be obvious immediately to the players). Room 27: I used the pregen wizard, an orc as the other human, and the gnolls were gnolls. 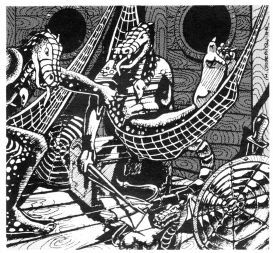 Sea Ghost: The second part of the adventure is aboard a ship. Pseudodragon = giant centipede works well with the addition of flight and invisibility. Punketah = Dark Priest, but use a few wizard spells. Captain = Gnoll pack lord. It took me just 30 minutes to do that conversion! As discussed before, classic adventures often have big problems when it comes to the narrative and to keeping interest levels high. Delves can get boring, RP might be missing, or there might be no choices. In this case, U1 delivers. The rest of the adventure works great as it is, since it has a strong story, fun exploration, and nice RP situations. I didn’t need to make any changes here – I just prepared myself mentally to run the adventure in a flexible manner as I would any other. There are some minor adjustments. Terraclips works on a 3×3 series of grids, meaning you have to think about how to recreate the normal U1 map. 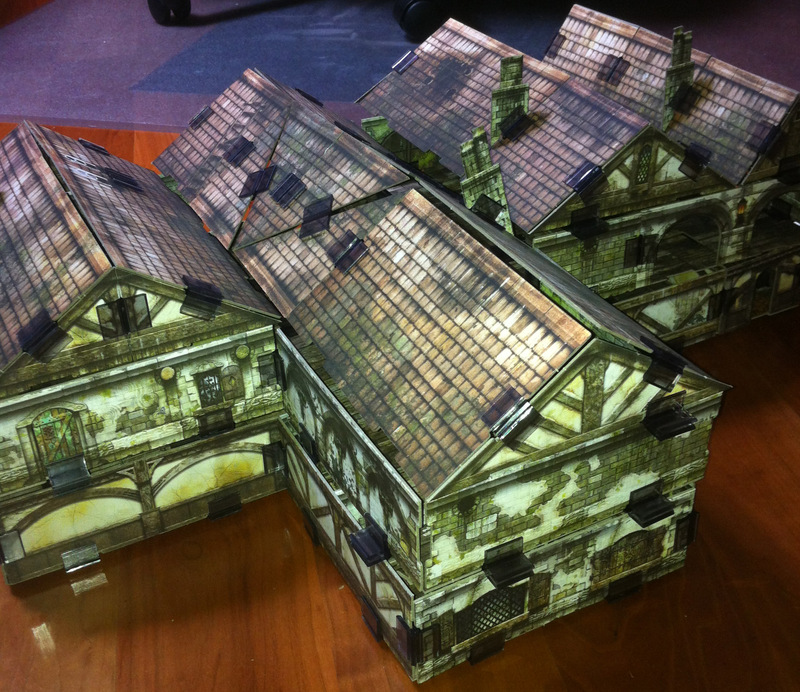 I kept interiors unattached to walls so I could reuse them on the second floor (otherwise I would need two sets of Buildings of Malifaux). I was really pleased with the result. Update: I was looking at my copy of the 3E Dungeon Master’s Guide II, and lo and behold, I had forgotten that it includes Saltmarsh as an example of a detailed town! It includes locations, NPCs, and a host of other material you can use to extend the experience and give them a home base that weaves into the mystery! While I join others in desiring more adventure content for continuing playtests, it isn’t critical. I find it very easy to use a classic adventure or to write my own. DMs in my group find the same thing. Though it may seem you can only use a minotaur or medusa so many times, I’ve seen both appear multiple times without knowing what they were – reskinning really goes a long way. It might take a bit of practice for someone not used to adventure writing and conversions, but with the methodology it is relatively simple to take an old adventure and upgrade it to D&D Next. A discounted bundle of all three adventures. Dungeon Master’s Guide II includes a detailed Saltmarsh. After a good conversion you can sit back like these guys! 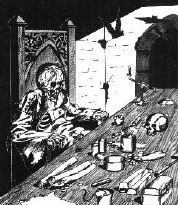 This entry was posted on October 17, 2015 by Alphastream and tagged AD&D, Authoring, Conversions, Greyhawk, Horror, Monsters, Playtesting, Props, RPG History, Terrain.